The waters of three Upper Delaware Rivers, the East Branch, the West Branch and the Neversink, are incredibly clean, clear and free of potential toxins to the fisheries that inhabit these rivers. Even when these rivers flood due to rainstorms or snowmelt the valleys that are part of these watersheds contain so little farming and so few people, that though turbid, the water itself is extremely free of pollutants. We are concerned that this may change due to the potential for hydrofracking in our watershed. There are several agencies that are proposing to prohibit fracking in parts of our watershed, and others that will be testing for these fluids in some of the unprotected sections of our tailwaters. Protected sections will include those within as yet to be determined distances from the NYC DEP aquaducts that run under the East Branch, West Branch and Neversink watersheds, within the Catskill Park, various State Forests, and several communities that lie within the Neversink watershed. In addition, the National Park Service and the Delaware River Basin Council will be testing the Main Stem effectively up to Hancock, but not in the Tailwaters that feed the Main Stem. Between the watershed lands potentially exempted by DEP and the Main Stem lie five to ten miles of river in the East and West Branches: e.g. the lowest section of each river. Within those two river sections WTF has proposed to conduct a monitoring program to establish existing water conditions. This will allow a comparison to later conditions in the event of a toxic waste spill, such as by hydrofracking operations in the basin above the testing sites. This is needed from a legal point of view, if the fishery is harmed by the spill. That is, if we cannot prove beyond a shadow of a doubt that the water was initially free these toxins, the gas industry will claim there were always there. Ridiculous as that sounds, their claim would hold up in court. Given the need for this testing, WTF applied for and was awarded a Conservation Small Grant of $1,500 from the Federation of Fly Fishers Conservation Committee. The work is to be performed by Community Science Institute (CSI) of Ithica, NY, utililzing access provided by WTF members' guide boats. Hydrofracking will most likely occur somewhere in New York State, but we do not exactly where as yet. To minimize this impact, WTF has signed onto a variety of petitions and drives to stop fracking all across our State, as well as specifically within our Upper Delaware Watershed. However, given the strong political drive to allow Hydrofracking, we believe we must be prepared for the worst. We understand the best way to do this now is to determine the baseline water quality of our rivers in those areas where franking is most likely to occur, and where water quality has yet to be monitored. The underlying purpose behind this is to allow us to create a data base of water quality that will be acceptable in a court of law should a franking fluid spill occur. Most monitoring testing conducted currently is not up to these standards. The problem is that unless there is a proper Chain of Custody, ie one that is admissible in a court of law, for the water testing then the tests will be held unacceptable in a court of law. Thus, the offending gas companies will not be held to be accountable for the appropriate legal liability from their spills. This upshot is that testing company staff, not volunteers, must both collect the water samples as well as conduct the appropriate water quality tests. This is the testing process we will be pursuing in April, 2013. We have received an FFF Conservation Small Grant of $1,500 to conduct these tests. In addition, our application with FUDR for the remaining $1,500 necessary to do the tests was recently approved. We are now in the process of setting up a date to bring a staff member of Community Science Institute on a guide boat with us down the East and West Branches to test the water. 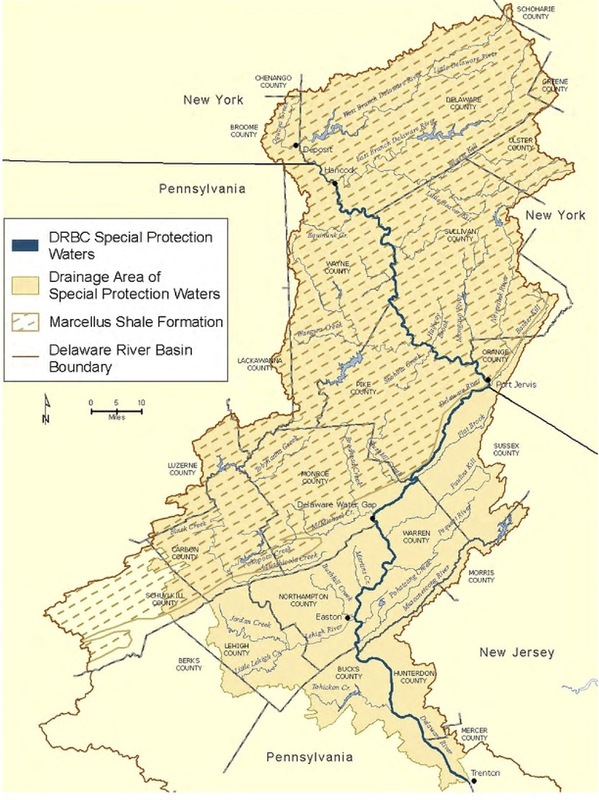 The area to be tested is that portion of these two rivers below the NYC DEP's Proposed Infrastructure Buffers and above the Delaware River Basin Councii (DRBC) Special Protection Waters area. 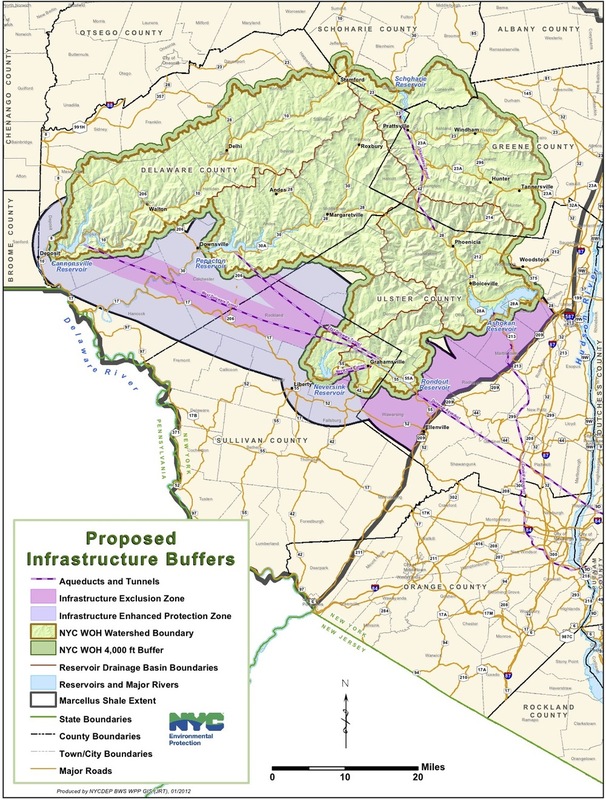 The NYC DEP is requesting the State to protect their infrastructure with a 7 mile buffer, as shown in the attached map. The DRBC is testing their Special Waters area, which is the Main Stem of the Delaware River below Hancock, NY. The length of river between these to areas is approximately 5 miles on each branch. In what we feel is to be the unlikely event that NYS DEC does not honor NYC DEP's request for proposed buffers, we will then apply for funds to test the additional unprotected areas.